Thank you for considering NOC for your upcoming corporate program. Outdoor adventures provide healthy, engaging, and active recreation, while demanding teamwork and cooperation. No one will be checking voicemails while paddling down the river or zipping through the trees. Let NOC help you plan the perfect outdoor itinerary that’s oriented to your group's purpose and goals. Asheville, NC: Spend the day with bald eagles on the French Broad River and enjoy some of the finest craft beer in the country afterwards. Atlanta, GA: Float the day away on the Chattahoochee River or for more adventure, explore the Wild and Scenic Chattooga River. Knoxville, TN: Get out of the office to check out the Great Smoky Mountains National Park and cool off on the splashy and fun Pigeon River. Chattanooga, TN: Experience non-stop action on the Ocoee River, and afterwards check out the Ocoee Olympic Whitewater Center, home to the 1996 Olympics. Bryson City, NC: Enjoy the day from river-to-ridge, rafting the Nantahala River and zip lining through the gorge. For the ultimate adventure, check out our Adventure Pass. Download our Group River Trip Planner for more information or call 828.785.5010 to get a trip quote. Our Nantahala River Campus offers deluxe lodging, meeting space, group dining, rafting, zip lining, team building, and more. 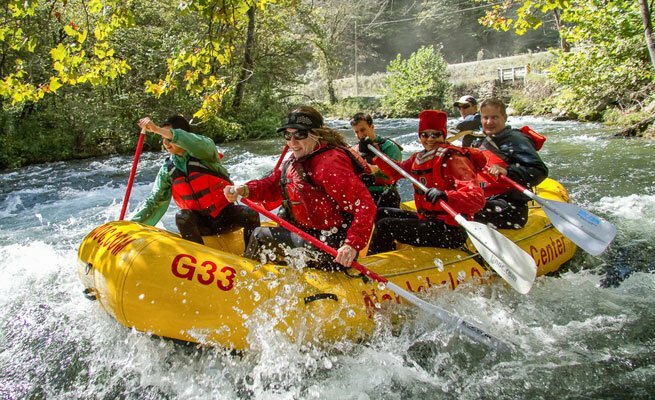 Download our Nantahala River Campus Group Guide to start planning your group retreat today. In this guide you can find out about all the activities, lodging, and meals available at our Nantahala River campus. Almost every group we work with has special requests, so please feel free to call us at 828.785.5010 and we'll help you fulfill your goals and expectations. We look forward to hosting your next corporate event!